The record is made up of 1 volume (291 folios). It was created in 27 Feb 1936-1 Apr 1940. It was written in English and Arabic. The original is part of the British Library: India Office The department of the British Government to which the Government of India reported between 1858 and 1947. The successor to the Court of Directors. Records and Private Papers. 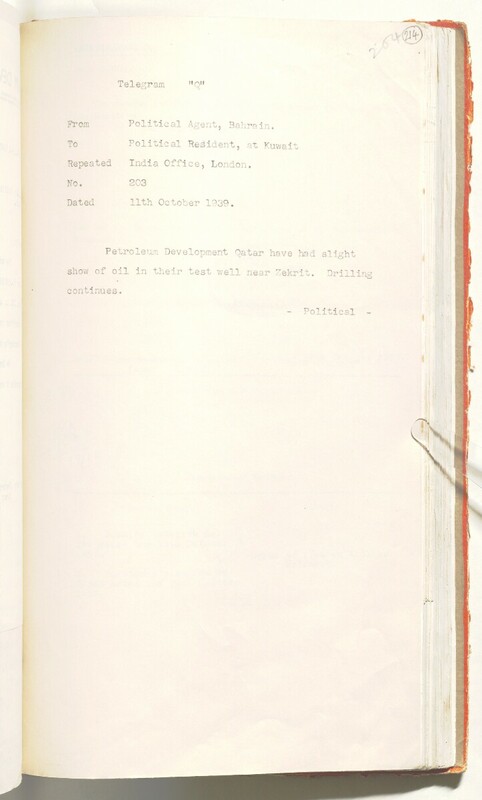 The volume contains copies of documents and correspondence in English and Arabic exchanged between the Sheikh of Qatar, Petroleum Concessions Limited, the Political Resident A senior ranking political representative (equivalent to a Consul General) from the diplomatic corps of the Government of India or one of its subordinate provincial governments, in charge of a Political Residency. in Bushire, and the Political Agent A mid-ranking political representative (equivalent to a Consul) from the diplomatic corps of the Government of India or one of its subordinate provincial governments, in charge of a Political Agency. in Bahrain on the Qatar Oil Concession. There is also correspondence on the employment of personnel by the Petroleum Concessions Limited for the camp at Jebel Dukhan, and updates on the drilling operations. The volume includes a letter from the Political Agent A mid-ranking political representative (equivalent to a Consul) from the diplomatic corps of the Government of India or one of its subordinate provincial governments, in charge of a Political Agency. to the Shaikh, in English and Arabic, to congratulate him on the discovery of oil in Qatar dated 14 January 1940 (folio 243). sketch of 'navigation marks' to build to facilitate the navigation from Bahrain to Zekreet [Zekrit] and map of the 'Launch Route' (ff. 258 and 259). There is an index at the end of the volume (folios 260-286). The papers in the volume are arranged chronologically. There is an index at the end of the volume, on folios 260-286. The index is arranged chronologically and refers to documents within the volume; it gives brief description of the correspondence with a reference number, which refers back to that correspondence in the volume. The main foliation is in pencil on the top right corner, encircled. The numbering starts on starts on the first page of writing; then 9, 10A, 10B; then carries on until 290, which is the last number given on the back cover. There is a second foliation, in pencil on the top right corner, starting with folio 1 (numbered 1a) and ending on 259 (numbered 249).